Scythebill: Scythebill 12.3 is here! The IOC 5.3 checklist - released 4 days ago - is now available. 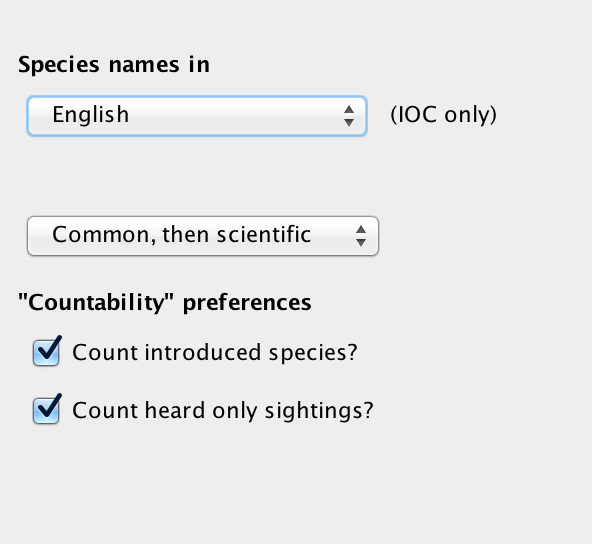 There's also a few small features added this time around, most importantly better support for those of you who don't "count" introduced or heard-only species. Purple Swamphen is split 5 ways. Silver and Red-billed Gulls are lumped. Four-colored and Gorgeous Bushshrikes are lumped. ... but for the full list, see the IOC website's species updates. Since the last release of Scythebill, I've been determined to finish cleaning up all the country checklists. And so I've gone through Europe, Asia, and the Pacific Ocean, correcting every last country's checklists against official checklists (or as close to official as I could get), adding and removing species, setting rarity status, and filling in earlier blanks for Andorra, San Marino, and South Sudan. The effort resulted in over ten thousand improvements! Done, right? No! After that, I went through all 10,705 species of birds, eyeballing each checklist-built range map to see how it matches with an "official" range and to look for oddities. That resulted in a few hundred more corrections and clarifications. Once again, I'd strongly recommend that with this release you try out the "Verify against checklists..." option in the File menu. I suspect that at this point most of its findings will point out mistakes in your existing sightings, but I'm sure there are still some glitches in the checklists. Finally, I should note that the county-level checklists in Great Britain and Ireland are not in great shape. I don't have access to resources that would let me clean up the existing ones or add new counties to complete the set. I'm strongly considering removing these from the program altogether. Let me know if you feel strongly one way or the other. Getting the checklists cleared up took the vast majority of my time in this release, but I did get a chance to squeeze in a few improvements. If you are the sort of lister that doesn't count heard-only sightings, or doesn't want to consider introduced birds, you've had two choices until now. Either you didn't enter those sightings at all, or you hand-tuned reports to exclude those sightings. Now, just click one checkbox and you're done! Those sightings will still show up in reports, but they won't count in numeric totals, and they won't show up as "lifers" when you're entering species. Scythebill will also now take advantage of the checklists to default a sighting's status to "introduced" or "not established". I'd always wanted to do this, but didn't trust the checklist contents enough to do so. Now I do! Also, sightings of the feral form of Rock Pigeon will automatically be entered as "introduced". Scythebill reported an error if you tried to bulk edit the date of sightings that didn't have any date. Users sometimes got errors when adding new locations in Browse by location.